As promised, a revamped Subsidy Sam with new illustrations from Josh. We have posted it as jpegs so that you may share the story via social media; the PDF is available to download from www.cartoonsbyjosh.com for free. "You may print for personal use or email the PDF as you wish, but please consider making a donation via the page on Cartoons by Josh." We would like to reiterate the request for donations, no matter how small, to help cover the costs of this project and that of the children's story 'Timmy the Tiny Turbine' due out in August. Stories like this, especially when presented in a professional and credible way, help more people understand the fallacy of wind generation and the atrocious impacts on the environment, wildlife and the communities who have to live near developments. People need to realise that it costs every single one of us for the subsidies and financial support bestowed on this industry for no hope of energy security or emissions savings. It increases energy bills in some countries and taxes in others. It costs us all for the appalling grid upgrades to cope with the volatility of wind and a juggling act is required by grid operators to try and prevent blackouts when the wind doesn't blow or blows too much. "We are constantly being told that wind energy is ‘clean, green and free’ which is far from the truth. 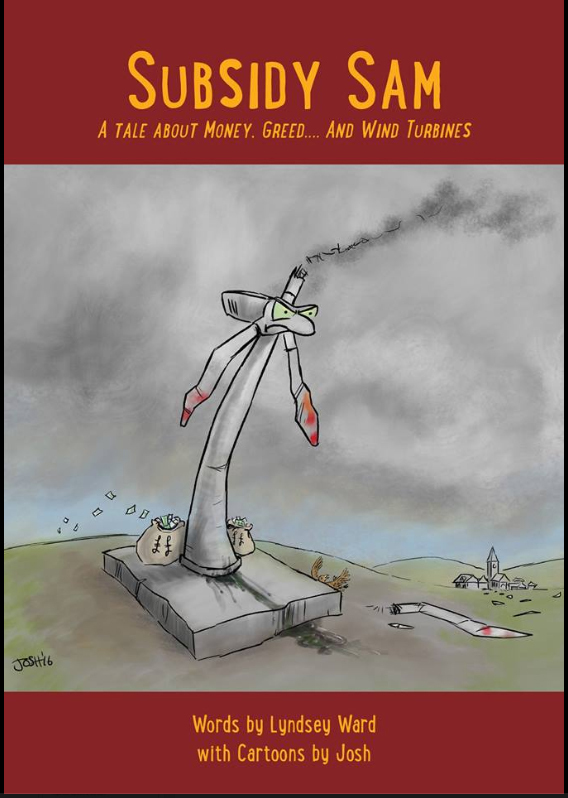 So please support this important work and help expose the many flaws and adverse impacts of wind turbine construction and operation." Subsidy Sam has made a start in a new and innovative way and there is more to come very soon. The people behind this have worked very hard to get it this far and they deserve our support. We also need you to help and to fire it around the world to advertise the next story, Timmy the Tiny Turbine. Whenever you share this post please ensure that you include this explanatory introduction. Thank you. 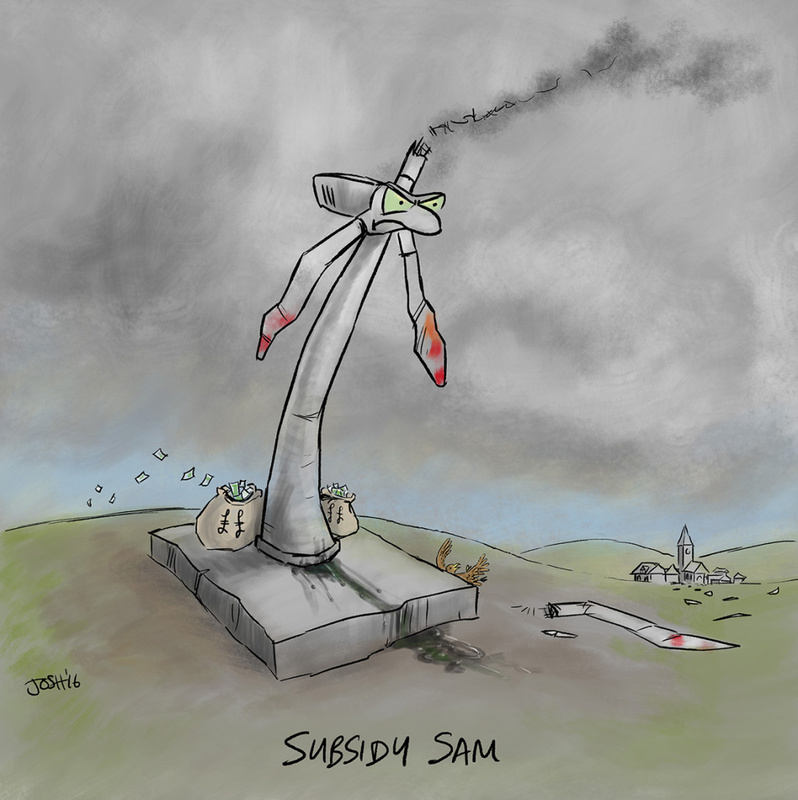 Friday funny – Subsidy Sam in the news! 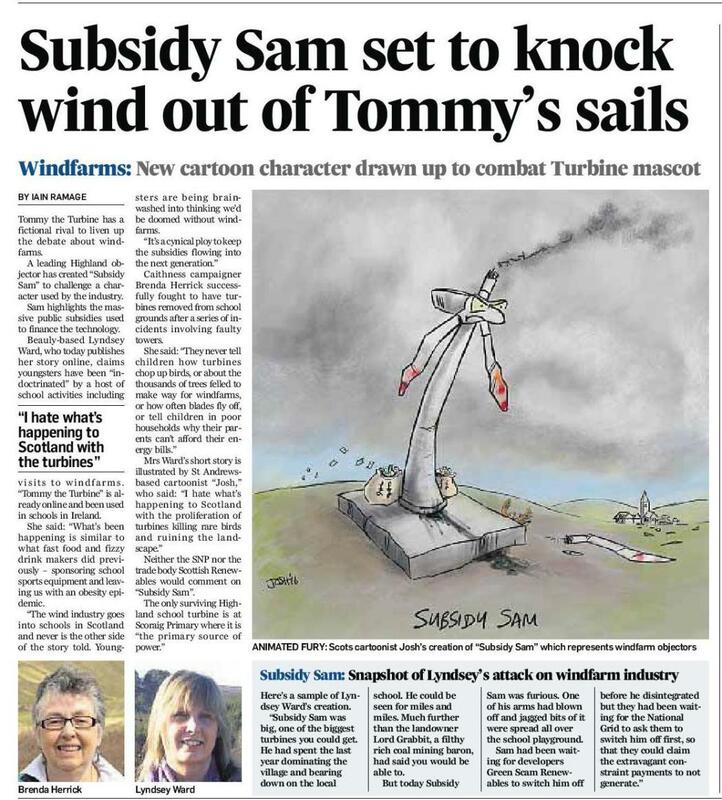 Josh writes:’Subsidy Sam’ is a children’s story written by Lyndsey Ward to counter the shameless pro-wind propaganda allowed in schools. Lyndsey asked me to help out with a cartoon and I was only too happy to oblige. Today ‘Subsidy Sam’ made it into The Press and Journal, a Scottish newspaper – see below. You can read the whole story on the Wind Energy’s Absurd Facebook page and, as Lyndsey suggests, please do post/share/Tweet/Facebook as much as you can. I will update with a link to the online version when it becomes available. Here is the cartoon on its own should you need it.